What Should Be In Your Media Kit? An advance news release. 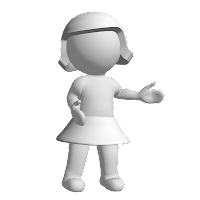 This is used to announce a time-oriented event or activity, such as announcing a seminar you are sponsoring. A backgrounder. This document provides detailed or in-depth information about an issue, a product or service, or your business. – For example: You reach a significant anniversary — this news release provides the history of the business up to this point. – Or: You issue a quarterly or annual report about local economic or labor conditions to coincide with national employment projections. Feature news releases. These news releases often result in “profiles” in the local media. Take a key topic and provide your perspective. – “Unemployment numbers are misleading,” resume writer says. Then explain why you believe this is so, backing up your opinion with facts. The follow-up. Sent out after an event to report results. — If you had a contest for “the worst resume ever,” issue a news release that you’ve selected a “winner” and include a copy of the winning entry and also the made-over resume. Your picture. Get a professional head-and-shoulders photo of yourself taken. Information about you. Your brochure or a written description of your current business, the services you offer, and your biography (or your resume or vitae). History of business. How you got to be where you are — when you started, what you’ve accomplished, how it’s changed. Previous media coverage. Reprints of articles about you that have appeared in other publications. Remember, publicity begets publicity. For more information on publicity, attend my free "Feed the Media" call on Wednesday, Nov. 9. This past weekend I was involved in a hit and run car accident. As witnesses pulled around me to continue on their day, I started thinking about personal responsibility. Obviously the person who hit me wasn’t taking any. You get the idea. Excuse after excuse after excuse. And usually wondering why things aren’t going the way they hoped. We’re ALL busy. And most of us think we’re busier than we are. Our clients are busy. Our vendors are busy. Our colleagues are busy. Those who succeed learn to manage their time and focus on those activities which will best serve their goals. As a business owner, even the owner of a lifestyle business, we occasionally need to make sacrifices –- get up an hour earlier, work on a Saturday morning/evening, whatever to finish something we committed to. It’s tough to stay on top of all things, all the time -– especially when we combine business with a personal life. I know this and experience the same and when I’m tempted to make an excuse, I remember something my Dad said long ago: “whatever you accept, you get more of” -– start accepting excuses (even from yourself) and you’ll get more of them. As the market becomes more competitive and clients become more discerning about where they invest their money, you want to ensure that you’re known for the *right* things: providing value and doing what you say you will…in addition to the *what* of what you do. Grab your “to do” (or “Action”) list. You know…the *big* one. Look over it and put stars or highlight anything that “should” have been done by now -– starting with things that are owed to clients, colleagues, vendors, etc. Make a commitment to yourself right now that you’ll assume personal responsibility in all things going forward, knowing that it means you’ll have to say “no” to things which don’t fit or you don’t have time for. Set aside a day this week to catch up on those things which need catching up on (delegate what you can, do the rest). Smile and give yourself a reward for getting caught up. Take time to identify your personal and business values. Each morning think about your top five values and act with intent throughout the day. Taking consistent action and living your life/managing your business according to your values will ensure that you’re on track for a life on your terms. And if those values include integrity, personal responsibility, value, Extreme Client Care™ and constant learning, you’re well on your way to success and the life you envision. It’s the millions of little things we do and choices we make, every day, which determines our business success or failure. If you liked this article, you'll want to hop on over to www.SandraMartini.com for more comprehensive business building and marketing strategies, articles and resources. 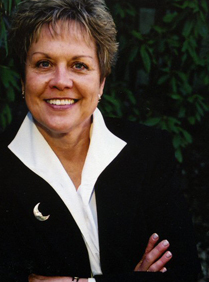 Sandra Martini, a Small Business Mentor, founder of Escalator Marketing™ and creator of the Escalator Profits Program™, teaches small business owners and entrepreneurs how to build sustainable businesses without losing their integrity or their minds. Writing Better Content -- from Resumes to Blogs! As a resume writer and as a publisher, I'm always looking for ideas on how to improve my copywriting skills, because words are at the heart of everything I do. Copywriting (defined) is "the art of writing to sell or achieve a specific goal." Whether we're writing to get our clients the interview (resume/cover letter) or to get prospective clients to call us (article writing/blog), we need to be creating good content. The headline of your article or blog post is vitally important. It motivates people to read your article. The same is true with the resume. A good headline (outlining our client's value proposition) can entice the reader to continue reading. The longer they read the resume (and/or cover letter), the more likely your client is to get an interview. 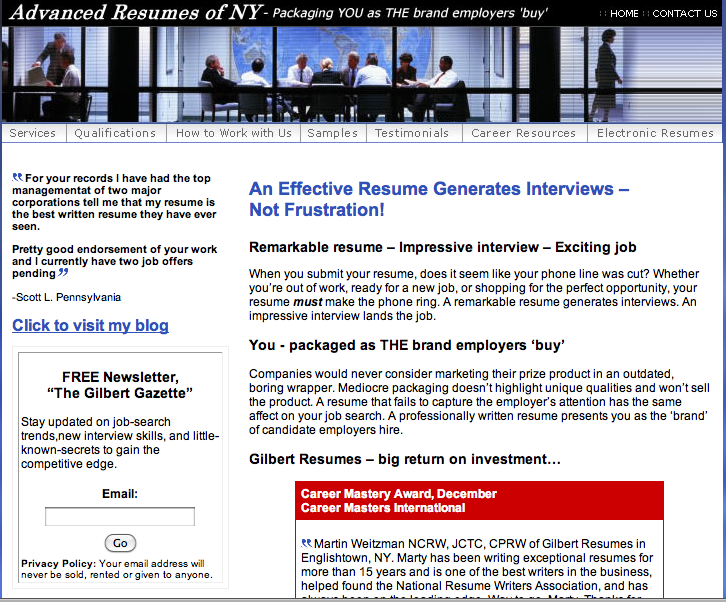 Most resumes get anywhere from 15 to 60 seconds of attention. A good headline can help get the first 15 seconds ... good content in the resume can get it 60 seconds or more! If you're writing a blog post and want people to read more about you on your website, then include a few relevant links at the end of your article. Tell them to click on the links to learn more about your niche. Always include some sort of call to action, even if you just want them to leave comments on your blog. One great way to really get your reader involved in your content is to use examples. In a blog post you can use personal examples. In your article content you may want your examples to be more general. In a resume, it's about CAR (Challenge-Action-Result) examples. Examples help paint a picture for the reader. Instead of just telling them something, you're showing them too. More and more content online is also using visual cues to make it interesting to the reader. Although you can include graphics on resumes and cover letters, you don't need images to create an impact. Your cover letter can incorporate subheadings, bold lettering on words that need to grab attention, and bullet points to draw the eye down. (Take a look at sales letters for examples of how to incorporate these tactics.) In addition to formatting your content for easy online reading, consider using photos (of a key client project for example -- not of your client), graphics (sales achievement graphs or profitability charts), and other images to help inform your reader. It's not uncommon for a blog to include a photo in every single blog post. Additionally, if you're writing a how-to article, you might include a few demonstration photos. 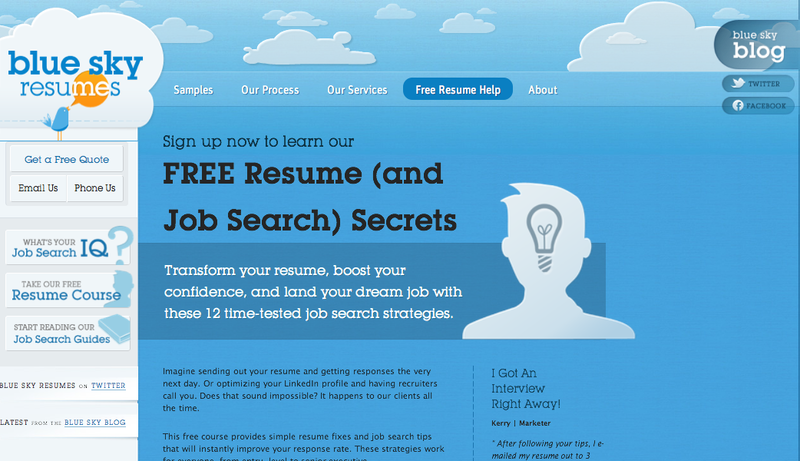 (Or before-and-after resume examples.) If you're writing a review (of a career-related book, for example), you might include an image of the product you're reviewing (book cover, or photo of the author). And if you're writing an informative article, you might include graphs, charts, infographics, or screenshots. Using a few handy copywriting tactics for your content can help improve readability and reader response and it can help you achieve better content marketing results. Try implementing a few of these ideas -- for your own projects, or your clients' -- and watch your results soar. Hey! This is my 600th blog post! So I want to spend this post talking about one of my favorite topics -- personal branding! Potential customers don't want to work with you if you're only so-so at what you do. Wow prospects with case studies of your current clients, with testimonials, and show them EXACTLY what you can potentially do for them. Never be mediocre when you can be great! As I write this blog post, I'm listening to a teleseminar from Susan Friedmann, author of "Riches in Niches." She's talking about how people like to work with experts. Part of being recognized as an expert is identifying what you're good at -- and then becoming known for your work in that area! As clients increasingly look to find a careers industry professional online (versus their local Yellow Pages), your personal brand is becoming increasingly more important. You need to stand out from the crowd. People are sharing things about you, videos of you, articles written by you day in and day out. There's no way to really know who's being exposed to you and your work. We emphasize the need for clients to think of their personal brand as a job seeker, but it's equally important for careers professionals! Think of your personal brand as the most important investment you'll make in your resume writing business. You need to put time, money, and energy into this investment. You might not see payoff right away, either. Here's how to build your personal brand. Before revealing your brand to the world, you first need to get clear on what exactly your brand is to yourself first. Make a list of words and phrases to help you identify one or more areas of specialty for your careers industry practice. Write down whatever comes to mind — the purpose of this exercise is to help you identify areas that will help you stand out from other resume writers. * What unique value do you bring to the table as a resume writer? This should be something that you alone can provide. It can be a unique twist on something already existing, or it could be something completely brand new. * What problems can you solve better than anyone? Specializing often helps. It's better to specialize in "working with IT professionals in career transition" than to specialize in "white-collar workers." * What are you deeply passionate about? Pick a topic that you could talk about for hours and hours and hours. Clients and prospects can sense passion or lack of passion in your voice in an instant. Once your personal brand is established for yourself, the next step is to convey it to the world. Step one is to express your brand in a clear and concise way. What you do and who you are should all fit into one clear sentence. For example, "I help stay-at-home moms successfully transition back to full-time employment" is a great pitch. Another example is "I help CFOs identify and target six-figure job opportunities." What you do should fit in a short, easy-to-convey sentence. This makes it easy to remember who you are. If they know someone who can use your service, it'll pop into mind immediately. If you took two minutes to get to what you actually do, they may not actually remember what you talked about next time it comes up. Once your branding and messaging is clear, put it on everything. Put your branding on your business cards, on your website, on your stationery, on anything that's associated with you. Make YouTube videos, post articles about the subject, and give talks and speeches if you can get in front of your target audience. The secret to growing a strong personal brand is to first come up with a crystal clear value proposition, then refine it into an easy-to-convey idea, and finally to push that brand into the world in every conceivable channel. As Susan Friedmann says, "There is big profit in small markets. The key to success is for you to be an expert, and to become known for that." As resume writers, we spend all day writing. So it makes sense that it can be difficult to get "psyched" to do more writing. 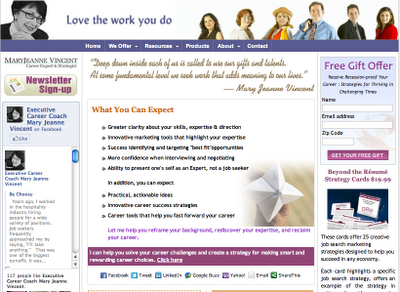 But writing articles about job search topics is a quick and easy way to attract new clients. And, other than your investment of your time and energy, it doesn't cost anything. There are plenty of places to "publish" your articles that will pay off. How can article writing boost traffic to your website -- and your income? There are dozens of free article websites out there. The article on the free content site contains a link to your own website. Readers, after reading your articles, may choose to click on the link and pay you an unexpected visit. Having your articles on the free content sites is also making these articles available to other webmasters who may wish to publish that article on their site. One of my articles (not on a job search topic, but careers topics are hugely republished!!) -- published to GoArticles.com -- has already been picked up by five other blogs. Article writing can increase your Google profile. How will people know to contact you? If other websites do pick up your articles, your article will include a link back to your site. (You write a "resource box" for your articles -- a simple 3-4 sentence bio for the end of the article that explains who you are and how they can contact you.) And anyone who reads the article on that site can still click on the link to visit your site. As the list of your published articles grow larger -- and more and more of them appear on different websites -- the total number of links to your site increases also. Major search engines are placing a lot of significance on incoming links to websites so they can determine the importance of a certain site. The more incoming links the website has, the more importance search engines attaches to it. This will then increase your website's placement in the search results. Article marketing has an enormous return on investment. Your published articles + the search engines = traffic to your website. It is no wonder why many resume writers are deciding to take the time to write more articles about their site than doing other means of promotion. Syndicating articles is a strategy that propelled Kevin Donlin to his current stature as a nationally recognized job search expert. Article marketing increases your "know, like, and trust" factor among prospective clients. Since many people are now taking their buying needs online -- including working with resume writers outside their geographic area -- having your website rank higher on the search engines through article writing is one way of letting them know about you and your resume writing services. It's especially effective if you concentrate your writing on niche areas -- for example, financial jobs, or technology jobs, or federal resumes. All of these have strong keywords and make great content for associated websites and blogs (in those industries). 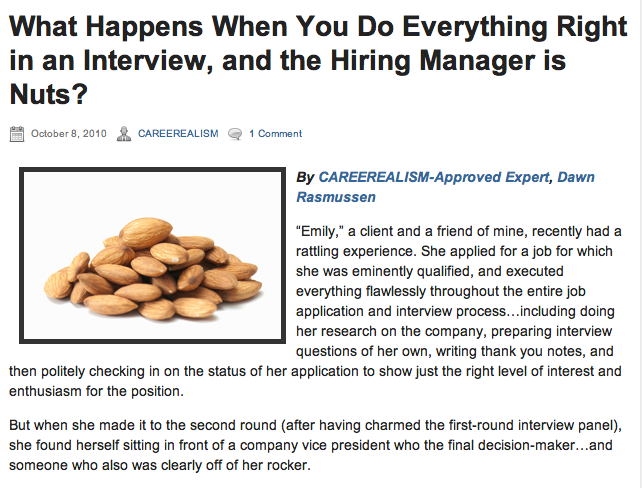 The good thing about writing careers-targeted articles is that you can write about things that people would want to know about. People want to know how they can be more effective in their job search, networking, and salary negotiation efforts. Try writing some articles and you may be surprised in the surge in site traffic, link popularity, and interest that results. And don't forget to recycle those articles on your own website and blog. I noticed Wendy's is running a new campaign based on the classic "Where's the Beef?" ads from 1984. The new campaign (to introduce Dave's Hot & Juicy Cheeseburgers), is "Here's the Beef." And that reminded me that, as careers industry professionals, we need to give prospective clients "the beef" -- so they will choose us. The most important question to answer in any kind of marketing has always been: "What's in it for me?" In other words, "Where's the beef?" If your marketing and your content don't answer this question in 15 seconds or less, chances are you're going to lose your prospective client. If you really hammer the answer home in the first 15 seconds, chances are they'll read the entire article. 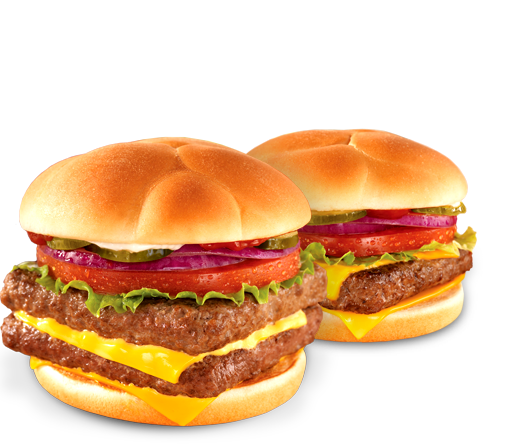 Have you tried Wendy's new burgers yet? Using graphics to convey a benefit can be an incredibly powerful tactic. For example, our goal is to get clients interviews! If you have a picture of a client, dressed in interview attire, with the caption, "Thanks, (your name)! I got the interview...and the job!" -- that can convey the "what's in it for me" answer much more powerfully than a written testimonial in just words ever could. Finally, spend a lot of time on your opening paragraph. If your opening paragraph doesn't quickly convey the benefits of reading your content, you're probably going to lose your reader. Even if you're writing a five-page, 5,000 word article, your time would be well spent if you focused 20 percent of your time on developing your first paragraph. Combine all these elements -- good design, good headlines, good graphics, and good structure, and your prospective clients will easily be able to see "Here's the beef!" Google+ is the new social network launched by Google. It's the fastest social network to take off in history, with over ten million members just a couple months after launching. It already has over a billion pageviews per month. However, it's not getting as much traction (growth) as Facebook and Twitter, because many people (including me, at first!) find it confusing. What sets Google+ apart from other social networks? And how can it be used to build your resume writing business? There are two main features that set Google+ apart from Facebook: Circles and Hangouts. Circles are like friends groups. You choose what groups to put people in without them knowing what group you've placed them in. You can then choose to share things with people in certain circles, without other people in other circles seeing it. Let's say you write resumes and coach clients on job interview tactics. You'll be able to put all your students and contacts of each group into their respective groups. You'll then be able to share course updates to one group without the other seeing...unless you want to share content between the two groups. Circles also solves another problem many professionals have had with Facebook. You want to be able to share photos and status updates with your friends, but not necessarily with your professional contacts. Circles makes this very easy. You can share just about anything with whoever you want and hide it from whoever you want. 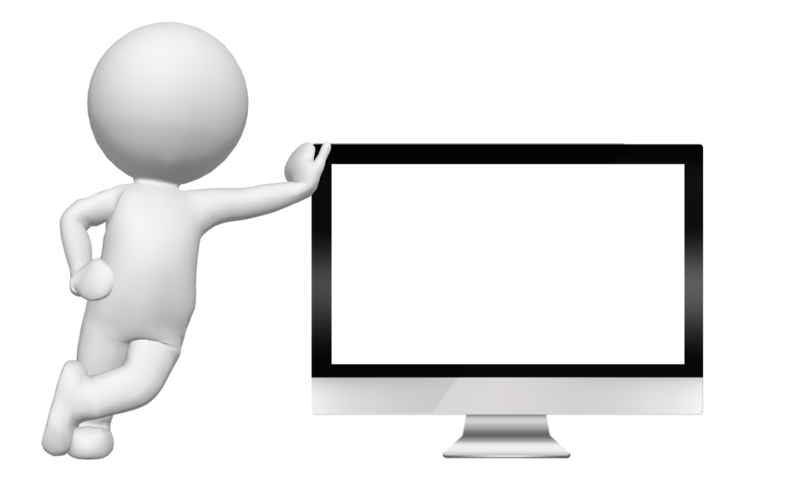 There are many video conferencing programs online. However, by and large every single one of them is a paid option -- and often these are quite expensive. Google+ changes all that. Google+ makes video conferences completely free, backed by Google engineered technology. You can have any number of people join a Google+ hangout. You can invite people one by one, or you can open a hangout to an entire group of people who can join at will. You can share YouTube videos. You can type text into a chat box. The speed of the service doesn't slow down no matter how many people you have on it. In short, the Google+ Hangouts makes it easy to hold video webinars as well as video conferences with clients or other resume writers. Is Google+ Here to Stay? Of course, if you're going to adopt a new social network, you want to use one that other people are actually on and one that's going to be around for a while. Will Google+ still be here a year or two down the line? There's no way to know for sure. The uptake was much faster than any other social network in history, but users' number one complaint today is still that there's "nobody else on it." If your resume writing clients are already on Google+, then you probably should get yourself on Google+. However, if nobody you know is on the network yet, you might want to wait for a short time first to see how it plays out. If you're interested in a full, 28-page special report on "Getting Started with Google+," sign up for a Bronze membership to BeAResumeWriter.com and you can find that special report in the "Paid Member Resources" section, along with other special reports, a full archive of back issues of Resume Writers' Digest, and Pass-Along Materials (PAM) content that you can repurpose and use with your clients. Although I believe it is possible for a resume business to succeed without a website, an effective website that draws "significant" traffic (and significant can mean different things to different people), can help propel your business. Generally, the more traffic you have, the more prospective clients you will have. #1 Social media. Social media works quickly and if you have a large following on any of the social media sites (Twitter, Facebook), you can generate a ton of traffic to your website quickly. The key is to create attention-grabbing posts that arouse curiosity, make people laugh, or stir up a controversy. You want to generate click-throughs to your website. Make the most of your social networking tactics and use technology to get the job done. For example, one StumbleUpon post can be integrated with both Facebook and Twitter profiles so you're making waves on all three social sites at once. #2 Article marketing. Article marketing works well when you concentrate your efforts on quality article marketing sites with large audiences. One well written, informative article, rewritten a few times, and submitted to a handful of directories can generate the traffic you're looking for. Be sure to include a bio box that includes a call to action and a link to your website to motivate click-throughs. #3 Blogging. 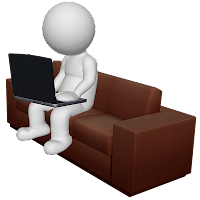 Post on your own blog or be a guest blogger on a blog with a large number of subscribers. Like social networking, if you offer an informative, controversial or entertaining post, youíll have people clicking through to your website like mad. Of course, if you also promote this wonderful blog post(s) via social media, you can double your traffic results. #4 Video content. It's amazing how quickly a video can go viral. Like print content, videos that entertain, stir up a bit of controversy, or offer tremendous value cause a buzz. They're forwarded to friends and downloaded on laptops and mobile devices around the globe. A good video can generate all the traffic you need. Again, integrate a bit of social media to promote your video, blog about it too, and you can multiply your traffic results. #5 Partnerships. Partnering with another business can work quite well to generate traffic fast. The key is to come up with a mutually beneficial agreement. Find people in the careers industry that are willing to work with you and help each other drive traffic. A partnership may include guest blogging on each others' websites, swapping advertisements, or even promoting one another in your e-newsletter. Itís possible to drive a ton of traffic to your website fast. The trick is to have a plan in place, know your audience and your goals, and take action. If you're doing Facebook ads or Google Adsense, you might be driving prospective resume clients to your website who aren't necessarily ready to buy yet. But you've already spent money to get them to your site ... it would be a shame to let them leave your site without capturing some information that will allow you to keep in touch with them in the future -- and provide value to them at the same time. Creating a list of interested people gives you a base with which to begin building -- or to expand -- a successful resume writing business. These are people you can consistently contact and get a favorable response to your product offerings. So how do you get your website visitors to bite? You want to provide content about more than just writing a resume -- because your prospects might be at various stages of the job search process -- and you want to provide information that will be valuable to them no matter where they are in the job search cycle. * Create an easy to use opt-in page -- This is the page on your website where customers enter their email address and name. It could be for a free resume critique or an ebook. Be sure to have it stated clearly that by filling out the form they are allowing you to contact them with future offers and information. The worst thing you can do is to deceive customers and send them things without their permission. 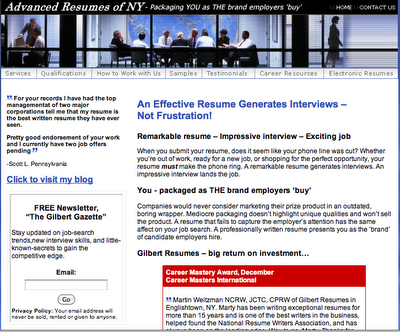 A good example of this type of offer/opt-in is Marty Weitzman's Advanced Resumes of NY website. * Offer something that they want -- With the opt-in information, offer a special report, discount on first order, video link or something else that they might otherwise have to pay for on another site. * Keep your promises -- If you are offering a monthly newsletter with engaging content and discount offers, make sure that that newsletter comes each month to their inbox. Also, create compelling offers that they will want to use and tell others about. Another example is Mary Jeanne Vincent's website. Not only does she have the opt-in list for her newsletter, but she also offers a free special report, "Recession-Proof Your Career." * Give links that work -- Test your links to pages before placing them in email text. Especially for links to your website. Customers may try once or twice to reach your page, but you won't get a third try if it doesnít work. Do you want to build a responsive email list? Inspire trust, confidence and loyalty in your customers with the tips above. 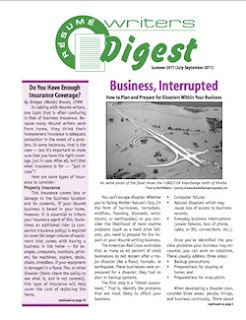 The theme of the most recent issue of Resume Writers' Digest is disaster recovery. Probably the one disaster ALL of us have experienced as a resume writer is the loss of data. Whether it's losing the file you were working on when the power blinked or, as has happened to me on at least three occasions, the loss of data when your computer dies. I know I'm not the only one, because I see your anguish on Facebook when it happens to you! Even if your primary computer cost several thousand dollars, you probably place a much higher value on the data that's actually stored on computer. Since we conduct the transactions of our resume business on our computers (not to mention financial records, family photographs and other items that are now stored solely on our desktop and laptop computers), a single catastrophic failure of your computer's disk drive could result in an incredible loss. You can protect against this type of scenario by periodically backing up your data to an external hard drive. Some people prefer this over backing up their data and documents online and sending their data into "the cloud." There's something reassuring about knowing that your data is backed up to an external drive that only you have access to. But while backing up our data is something that we know we should be doing regularly, chances are we're not actually doing a good enough job at it. Fortunately, there are some ways to automatically back up your computer files to an external hard drive, reducing the chance that you will suffer any significant data loss. Before you can set up your backup process, you'll need an external hard drive. In recent years, the price of hard drives has dropped significantly, so you should be able to purchase a high capacity drive on practically any budget. Because the backup process is not something you will be performing every day, don't be overly concerned with data transfer speeds. For most people it's simply not necessary to have the absolute fastest hard drive for backup purposes. You should, however, try to get the largest hard drive you can afford. The more space you have for backup storage, the better. In order to have your backups occur automatically, you will want to have software that manages the process for you. Having to do manual backups of all your files on a weekly basis is a sure way to get frustrated and stop doing backups altogether. If your computer runs Windows 7, then you already have a software solution available to you -- the "backup and restore" feature. You can begin the process on Windows 7 by entering yourControl Panel, clicking System and Maintenance, then selecting Backup and Restore. The Backup and Restore function lets you choose the folders of your computer that will be backed up, and schedule the process to occur automatically. Some earlier versions of the Windows operating system also have similar functions. If you have a Mac like I do, you can use Time Machine to set and schedule your backups. Find information how to do that here. You can always refine your backup process later, but the important thing is to get a schedule in place and get into the habit of protecting your important data. 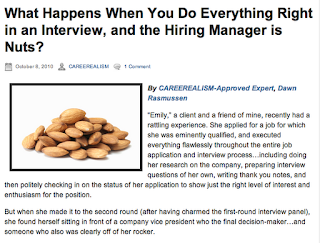 As resume writers, we are often the first stop for someone in the job search. But today's employment market is so very different -- how relevant is the value we provide? Are we arming our clients for battle in the short-term... or for the permanently changed employment market? 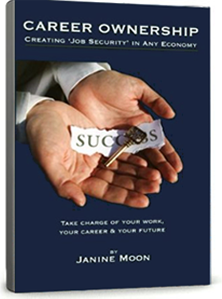 Join Janine Moon, author of "Career Ownership: Creating 'Job Security' in Any Economy" for a free one-hour teleseminar on Wednesday, Oct. 12 at 7 p.m. Eastern time to learn strategies you can share with your clients to help them win "The Employment Game." With both unemployment and underemployment in double digits, and with millions of jobs in the U.S. alone going begging because workers don't have the right skills, you have the opportunity to help educate your clients to the underlying structural changes that they will meet in their work lifetimes. Consider this: One piece of the mortgage crisis is that many home buyers were not prepared to be home owners ... in a sense, the market experienced a mismatch between what's required and how an individual prepares to move from "renting" to "owning." We could say that there's an underlying structural problem in the home ownership process -- i.e., the lenders and buyers don't have the same expectations. The same is true in today's employment market: While everyone wants that "permanent, secure" position (and they want it to be theirs), few are prepared for what that means in today's global marketplace. "Structural unemployment" may define that best: What employers need and what workers have don't match. "Career Ownership" is the preparation necessary for that elusive "security" that so many want. Just like home ownership, however, the skills and mindset needed for career ownership are different from those needed for having a job -- or, put another way, for "renting work." On Oct. 12, Janine will present "The Employment Game: How Are You Preparing Your Clients." In this teleseminar, she will review the employee skills and mindsets needed for any security in today's workplace. You'll receive a Career Ownership quiz that you can use with your clients to provide clear direction on what today's organizations must have from workers for both parties (employer and employee) to succeed. You'll also understand how the Career Ownership model differs from traditional job search and career-pathing models, and the value of a holistic approach to your clients' career assets. While it's a model that places the responsibility for security squarely on the shoulders of workers, Career Ownership maximizes worker value to employers and creates a core of security in the midst of workplace upheaval. Janine is a Master Certified Career Coach and author of "Career Ownership: Creating Job Security in Any Economy." The teleseminar is sponsored by BeAResumeWriter.com and Resume Writers' Digest. The program will be presented live on Wednesday, Oct. 12 from 7-8 p.m. Eastern time via teleseminar. The teleseminar will be recorded; if you are unable to attend live, you will be able to access the recording in the "Free Level Resources" section of the BeAResumeWriter.com website. Career Professionals of Canada has announced the winners of their 2011 Award of Excellence. The CPC Awards of Excellence benefit the general membership, individual members, their organizations, clients, and the industry as a whole. It is a great privilege to be nominated and an even greater honour to be distinguished as the recipient of a CPC Award of Excellence. Career Professionals of Canada is committed to setting the standard for excellence in the Canadian employment and career industry. Recognizing outstanding individuals in our profession is one of our most important activities. Review: "How to Succeed as a Small Business Owner...And Still Have a Life"
"How to Succeed as a Small Business Owner...and Still Have a Life" is a very honest book on how to get the most out of your business. It is a small business owner's manual written by Bill Collier, whose company went through lots of trials and tribulations. With lots of hard, dedicated work, he finally reached business success. In his book, the author covers topics such as: putting your business on "auto-pilot," setting ambitious goals and achieve them, developing business plans, delegating effectively, attracting the right employees, and much more. In my opinion, this book is for anybody who already owns their own business, but feels that they are getting nowhere. Everyday business life seems to be all about long, long hours, cutting into their private life with no visible results. The only way out, according to Bill Collier, is by changing certain principles, which he describes in his book. 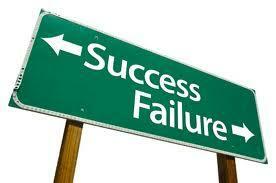 Principles that have helped him to move on and create the successful business he has. Overall, if you are feel like your resume writing business has become "stuck," then "How to Succeed as a Small Business Owner...and Still Have a Life" is a very valuable resource to own and read. 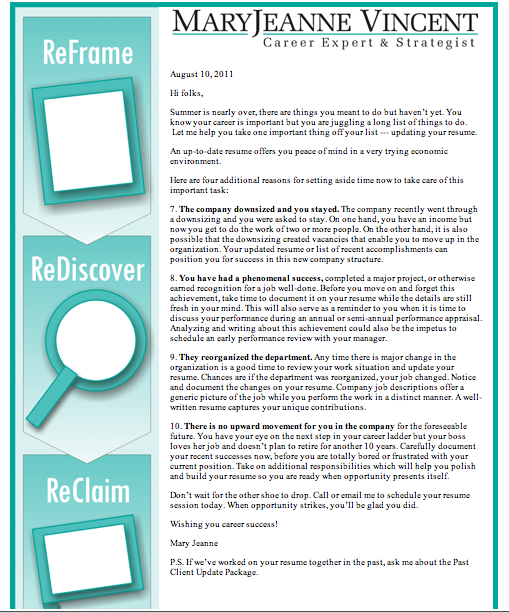 The Summer 2011 issue of Resume Writers' Digest is now online -- and the theme is "Disaster Planning." After witnessing the destruction of tornadoes (Tuscaloosa, Joplin), hurricanes (Irene, anyone? ), earthquakes (East Coast, really?) and flooding (right here in my hometown, Omaha) ... I was inspired to devote the theme of this issue to disaster preparedness. Realistically, however, the biggest "disaster" that we will likely face as resume writers is health-related. Self-employed resume writers are more likely to face a loss of income -- and maybe our business -- from a health crisis than from a natural disaster. If you're paying for your own health insurance, you'll want to read our story on "Choosing an Insurance Plan." You'll also want to read "Do You Have Enough Insurance Coverage?" and assess whether your business needs additional insurance protection. Probably all of us have lost data -- whether from a hard drive failure, electrical power surge, corrupted CD, or other technological failure. Another article in the issue focuses on "Backup Systems and Disaster Recovery" -- providing tools to prevent your data from being lost forever. Interested in getting the issue? Subscribe or sign up for a free membership at BeAResumeWriter.com and get access.